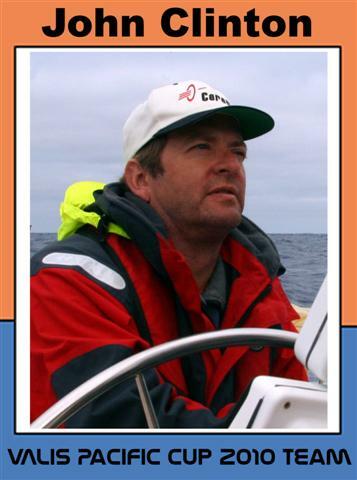 As you may know, VALIS has entered the 2010 Pacific Cup, and has again volunteered to be the communications boat for the race. This will be our third Pac Cup, and extrapolating from the improvement in our ranking from 2006 to 2008, we should do very well indeed in 2010! A big part of the race is putting together a team that not only knows how to sail, but knows how to get along with each other for over 2000 miles on a tiny boat. On VALIS, the race will probably take thirteen days or more, so crew compatability is a big deal. In the previous races we have been fortunate in this regard, and it looks like the 2010 team will be another great one. There are six of us, and we are: Paul Carson, John Clinton, Rich Jones, Edward Killeen, Jack Thomas, and me, Paul Elliott. Married to my one and only wife Lydia for 18 years. Other than sailing and coaching kids in every sport imaginable, I fish, ride bikes, trail run, take pictures, and generally enjoy anything outdoors. I am an office equipment dealer in Arkansas by trade, an occupation so dull that it was used as the Governator’s cover for being a spy in “True Lies”. But when asked “what do you do” I answer “Father of two, coach of whatever is in season, and sailor when the schedule allows”. The vast majority of my sailing has been inland racing in boats from 14’-40’ and I currently own and race the 26’ Jesse James. But with really active kids, I must confess to spending more time lately helping 7 year old boys develop bat speed and 9 year old girls work on their dribbling skills. A few years ago, about the time the mid-life crisis set in, I came to the realization that nobody in the big sailing centers from which ocean races originate had any idea that there was a lifelong sailor and competitive racer sitting in Arkansas just dieing to do an ocean race. So, I made a few calls, emails, etc. to see if I could get some exposure with these guys in hopes of getting to do the race that I’ve always wanted to. Since this epiphany, I’ve raced to Mackinac and Key West Race Week a few times. I’ve also done a few deliveries and a good bit of chartering in the Caribbean. The highlight in terms of offshore was definitely bringing VALIS back from Hawaii in ’08 (thanks to Paul E. for the chance and Rich for the hookup). Since that trip, I sometimes dream that I am clinging to the bed in an effort to avoid ejection from a poorly chosen bunk, only to be disappointed when I wake to discover it’s only a dream. Now that the race is getting closer, the disappointment is tempered with the knowledge that it’s less than a year till we do it again with a crew of friends that I don’t get to see often enough. I can’t wait! With a crew like Paul E. has assembled, I can’t honestly say that I add a whole lot except above-average resistance to complications from seasickness and fish guts, and a general determination to enjoy myself. I should be able to take up the slack in enthusiasm, should Edward have a stronger reaction to low bandwidth than we anticipate, I suppose. My good friend John has been a VALIS crewmember since 2004, and helped us prepare for the ‘06 Pac Cup. 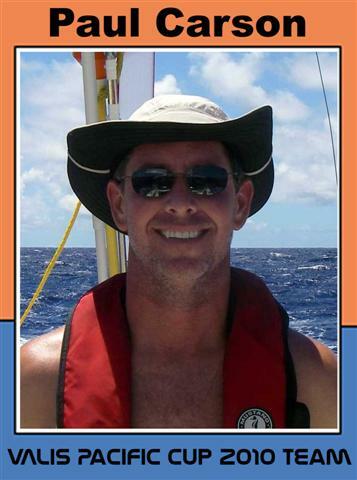 He crewed on the ‘06 Oahu-to-San Francisco return passage, and in 2007 joined Daniel Terhune and me on a trip to Fiji, where we helped our friend Jim Marco sail his Crealock 37 “Intention” from Lautoka, Fiji to Port Vila, Vanuatu. John was a valued member of VALIS team in the 2008 Pacific Cup, where he occasionally found himself standing watch for 21 hours a day (at least according to the watch schedule). John is a systems engineer for a telecom startup in Petaluma, and we were colleagues at my last company. I am confident that his 2008 Pac Cup experience has taught him not to annoy the person responsible for handing out the watch assignments. 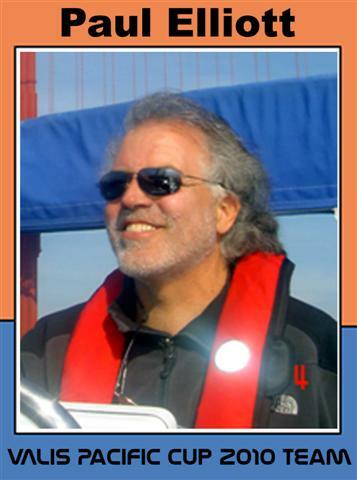 Returning from the wilds of the Pacific Northwest as a member of VALIS’ Pac Cup crew, Rich lives in Tigard Oregon and spends a lot of time sailing on the Columbia River, and up’n’down the Oregon/Washington/BC coast. Rich and his sailing sweetheart Edie are very involved in the Portland sailing scene including stints as ’09 commodore of the Small Yacht Sailing Club of OR (Rich) and ’08 commodore of the OR Women’s Sailing Assn. (Edie). Rich has many offshore miles to his credit, including he and Edie double-handing last year’s Pac Cup winner, Rain Drop, back home to Portland for Joby and Bill. Rich and I became acquainted after he crewed with Davey Glander on the homeward delivery of the Cal 40 “California Girl” after the 2007 TransPac. As you may know, Davey had helped me bring VALIS back home in 2006. Sadly, Davey passed away in late 2007, and in the aftermath of this Rich and I got to know each other. Rich was a key member of the VALIS 2008 Pac Cup team, and I look forward to his contributions in 2010. 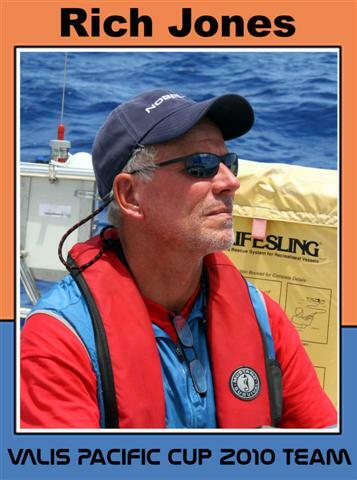 Rich brings onboard a positive attitude, experience, cooking skills, and a dogged determination to keep at least two-thirds of the Pac Cup fleet north of VALIS on the way to Hawaii. Edward is a lifelong sailor who makes up for what he lacks in skill with enthusiasm and willingness to do anything and everything on a boat. Edward has crossed one ocean and made it about halfway through another (stopping at Hawaii seemed like a good idea). Edward’s main reason for sailing in the Pacific Cup is to show his kids that adventure is a good thing and if you do it right you end up at a really nice island. 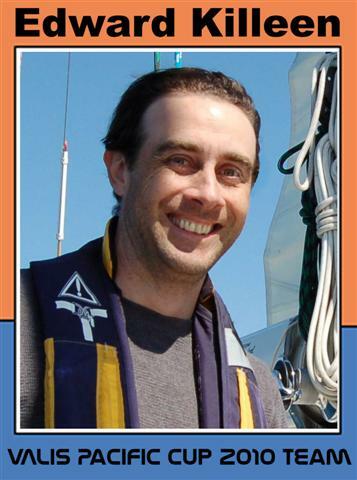 We first met Edward during the 2008 Pacific Cup, when he was preparing to crew on “Oceanaire” (here is Edward’s blog report on the Oceanaire campaign: http://evk4.blogspot.com/2008/07/before-start.html). During that race Edward and I had a friendly competition to see who could catch the biggest fish, but we were having so much fun that we forgot to keep score. I’m pretty sure that our fish was bigger. With the two of us, I expect VALIS to dominate the 2010 Pac Cup Fishing Derby! Commander Jack Thomas is a native of San Diego, California. 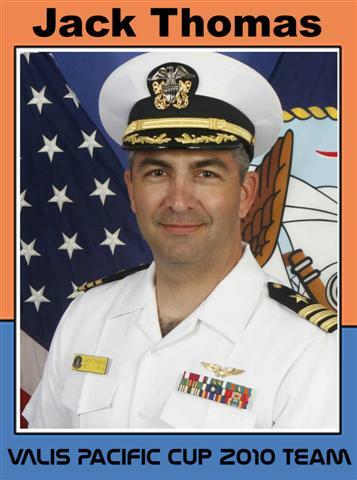 He was commissioned in the United States Navy upon graduation with a Bachelor of Science degree in Industrial and Systems Engineering from the University of Southern California in 1991. After completing flight training at NAS Pensacola, Florida and Mather AFB, California, Commander Thomas was designated a Naval Flight Officer and reported to VP-31 at NAS Moffett Field, California for initial training in the P-3 Orion aircraft. I came to know Jack on the internet, where we were corresponding about preparations for sailing his trimaran from San Diego to Oahu. As it turned out, the U.S. Navy had other plans for Jack, so his boat was shipped to Hawaii while the Skinny Dragons deployed to the Mideast. During our 2008 Pac Cup visit to Kaneohe Bay, Jack treated the entire VALIS team to an incredible tour of the Kaneohe Marine Corps Base, where we got meet the rest of his squadron. Since then we have remained in touch with Jack and his family, and are proud to have him on the VALIS 2010 team! I have been sailing since perhaps the age of six, with significant gaps from time to time. Prior to VALIS I had never sailed further than from Long Beach to Catalina, but I have found that I truly enjoy the long sea passages. I am a retired electronics engineer, and am able to indulge my continuing enthusiasm for hardware and software by puttering around with the systems aboard VALIS. My time at sea includes the three Hawaii voyages, and a trip down to Santa Barbara and the Channel Islands, all on VALIS. I have also sailed on other boats, including a delivery from Santa Barbara to Berkeley, sailing among the Marquesas Islands (South Pacific), and a Fiji-Vanuatu trip. I also serve on the Board of Trustees for the SETI Institute – http://www.seti.org/ — an organization dedicated to research in the areas of astronomy and planetary sciences, origin of life, chemical, biological and cultural evolution, and the search for extraterrestrial intelligence. I am particularly involved in the Allan Telescope Array, an installation of multiple radio-telescopes located near Mt. Lassen, used for both SETI listening and advanced radio-astronomy. This is definitely not a crackpot organization, but rather a serious group of legitimate scientists, engineers, educators, and other professionals. I am a founding member of the Mars Yacht Club: http://marsyc.org/, which definitely is a crackpot organization! This entry was posted on Tuesday 8. September 2009 at 17:17 and is filed under: Pacific Cup 2010. You can follow any responses to this entry through RSS. Responses are currently closed. | Trackback URI.